Why does the music you like have to be divided into ‘cool’, ‘bad’ and ‘guilty pleasures’? They’re a running joke for many people, the site where ‘new romanticism’ forced its way into the mainstream, but they’re coming to my town soon, and the 15-year old version of me would be most disappointed if I didn’t get a ticket. Like most concerts in enormo-domes my memory is likely to be as active a player in the event as the band members, but that’s OK. The music seemed to be unashamedly melodramatic. The costumes seemed to be a key element of a band performing itself and its music, but I wasn’t thinking like that at the time. It was a package. No internet, see. You get what you’re given. Later on, the music got smoother, but no less carefully arranged under its sheen. I was truly moved by ‘True’. As a teenager I guess I wanted to be true to something, to say truthful things, but I wasn’t sure what yet. The song didn’t nail it down so the mysterious desires that drove its rhythms it applied to me too. Musically, there was a sophistication to the arrangements. As I listen back, I realise I know all the clean little guitar licks and melodic basslines. Musically they’re way better than Duran Duran. Beneath the bluster is tenderness. I suppose it’s all way fey, and that’s OK, though these golden tackle sacks are NOT OK. I liked the music because it wasn’t particularly macho. I liked Cold Chisel and Dire Straits and The Jam and The Dead Kennedys and George Benson. And Howard Jones. Why can’t your tastes be cosmopolitan? Does liking Marvin Gaye make you ‘gay’? At the boy’s school I attended, apparently it did. And why would that matter anyway? Luckily I chose to inscribe my musical passions on my pencil case with biro rather than on my skin with tattooist’s ink. Turns out Spandau Ballet ‘listened to Marvin’ as well and I like joining musical dots like that. Musicians leave each other clues. Unless they meant Hank Marvin. Though I like him too. The film clips seemed to portray a mysterious world where something important seemed to be going on, but nobody quite knew what it was. 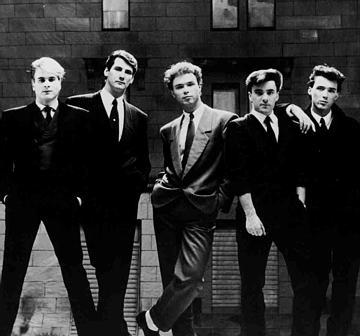 The cinematic world of prime Spandau Ballet seemed to be of mute intrigue, stylish spies, mysterious girls, and when things were literally ‘staged’ in sound studios the spaces were broad and filled with shadows. Weirdo tartan sashes gone, they now wore suits. I thought they were sophisticated, not knowing that was precisely what they wanted me to think. Two words: saxophone solo. I’d never heard them speak, you see. Maybe if I had I’d have realised their aspirations were similar to mine: to transcend their background (fashion mistakes and all) as they made their way into the foreground. 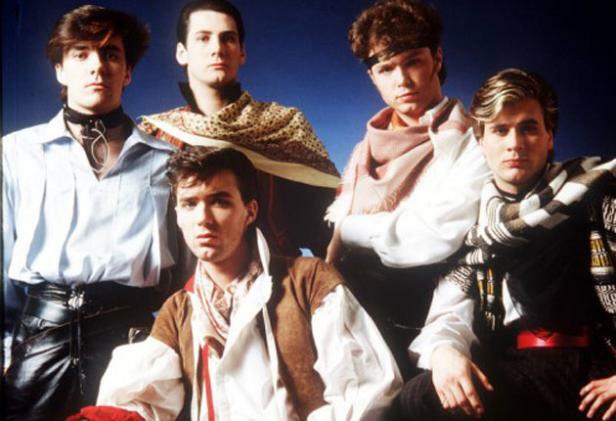 Under the dubious veneer of style, most of all the music of Spandau Ballet is made with love and borne on the distinctly indistinct drama of young passions, as strongly felt as they are difficult to describe. A simplistic yearning for sophistication. I knew this music was ‘commercial’. If it wasn’t it would never have made its way to me. I never wanted to be a new romantic. I lived in Townsville. My attempts at style were lame. But these attempts were aspirational, and that’s a property that the music of Spandau Ballet has in spades. Is this really ‘the sound of your soul’. Or is it the sound you wished your soul would make? There’s another story here, the story of a band getting it together, falling apart and reuniting which is apparently told in their doco Soul Boys of the Western World, and I’ll check that out I suppose, but it’s really this performance is about all of us revisiting a past that we’ve survived, in the knowledge that nostalgia isn’t what it used to be.